ALK gene fusionsand ROS1 gene fusions define unique molecularsubsetsof non–small-cell lung cancer (NSCLC).EML4,KIF5B,TFG,KLC1etc., are identified as fusion partnersof ALK;SLC34A2,CD74,SDC4,EZRetc.,are identified as fusion partnersof ROS1.These fusions lead to constitutive kinase activity and activation of downstream pathways, leading to carcinogenesis.It has been reported that the presence of theALKgene fusions and ROS1gene fusions are correlated with the efficacy of TKI therapy. Detection of ALK and ROS1 fusions in patients with advanced NSCLC indicates eligibility for treatment with ALK inhibitor crizotinib. The AmoyDx®ALK Gene Fusions and ROS1 Gene Fusions Detection Kitis an in vitro nucleic acid amplification test intended for qualitative detection of 26 ALK gene fusions and 14 ROS1 gene fusions. CFDA approved for clinical use in China and CE marked for IVD use in Europe. (3) Simultaneous PCR amplification of target cDNA and detection of ROS1 gene fusions with specific primers and fluorescent probes. 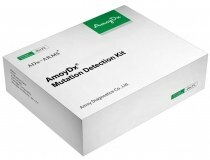 Наименование: AmoyDx ALK Gene Fusions and ROS1 Gene Fusions Detection Kit.